Have a week and want to see it all? Include Gallipoli and Troy as well as all that our 5 Day package has to offer. 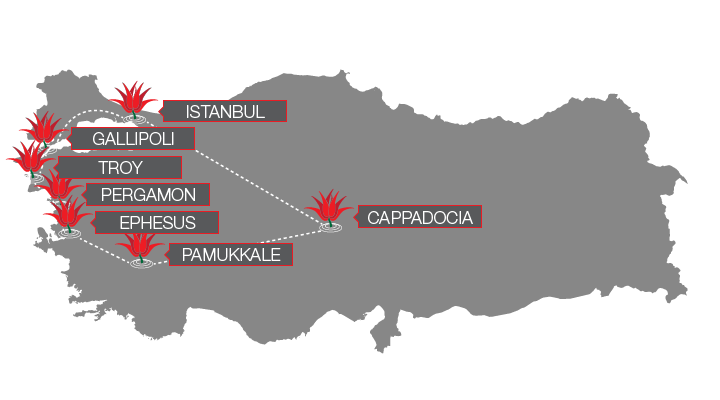 The battlefields of Gallipolı hold a special place in the hearts of Australians and New Zealanders not only on Anzac Day but all year round! Afterwards travel on to Troy Pergaman, Ephesues and Pamukkale. A direct flight takes you across to Anatolia where you can visit the amazing landscape of Cappadocia and see underground cities, hidden valleys, take a hike and fly in a balloon before returning back to Istanbul. Check-out and travel to Gallipoli. Lunch on arrival in Eceabat. After lunch visit Anzac Cove, original tunnels and trenches at Johnston Jolly, The Nek Cemetery, Chunuk Bair New Zealand Memorial, Lone Pine Australian Memorial and Brighton Beach. Evenig in Canakkale. Visit the ancient ruins of Troy,one of the world's most important archaelogical sites.After Troy your tour proceeds to Pergamon. Explore Athena and Trojan Temples, Temples of Zeus and Dionysos, Gymnasium of Youth, Odeon, Library, Agora, Great Theatre, Roman Bath and view Asclepion. Drive to Selcuk. Evening in Selcuk. Visit to the House of Virgin Mary, the City of Ephesus, Temple of Artemis and Ephesus Museum. Evening in Selcuk. Drive to Pamukkale. Visit the ancient city of Hierapolis with its Temple of Apollo,the Theatre, Necropolis and baths of Hierapolis Antique City.Finally visit the calcium terraces and pools. Evening in Selcuk. Transfer to Izmir Airport for your flight to Cappadocia. On arrival in Kayseri transfer from airport to your cave hotel. Evening in Goreme. Visit Derinkuyu Underground City, Ihlara Valley, lunch break in Belisirma Village by the river. After lunch visit Selime, panoramic viewing point and then Agzikarahan, a 13th Century Seljuk Karavansaray on the silk road. Evening in Goreme. Visit Devrent Valley and Pasabaglari Fairy Chimneys, Avanos, Uchisar Castle, Pigeon Valley and Esentepe for a panoramic view of Goreme Valley. Finally Goreme Open Air Museum. After your tour transfer to airport for flight to Istanbul.Upon your arrival at Istanbul Airport transfer to your hotel. From: Mr. Ms. Mrs. To: Mr. Ms. Mrs.